Professor Jaime Settle received her B.A. in Political Science from the University of Richmond and her Ph.D. in Political Science from the University of California at San Diego. She is the director of the Social Networks and Political Psychology Lab and co-director of the Social Science Research Methods Center. Dr. Settle teaches courses on various aspects of American politics, focusing primarily on topics related to political behavior, psychology, and communication. Prof. Settle is broadly interested in how contentious interpersonal interactions about politics affect the way that individuals perceive conflict in their environment, evaluate other people, and engage within the political system. She is currently working on a book manuscript that explores the effect of social media communication on our polarized attitudes about the people with whom we disagree politically. 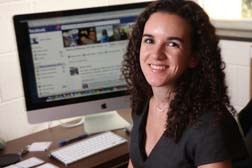 In other work, she has used large-scale datasets derived from online social networks (such as Facebook) to refine an understanding of the effects of our social network on how we think, feel and behave politically. She also strives to incorporate data and methods from the natural sciences into her research to help explain fundamental aspects of political behavior, such as the influences on the way people talk about politics. Her work has been published in Nature, the Proceedings of the National Academy of Sciences, the American Journal of Political Science, the Journal of Politics, Political Behavior, Political Psychology, and Political Science Research and Methods.